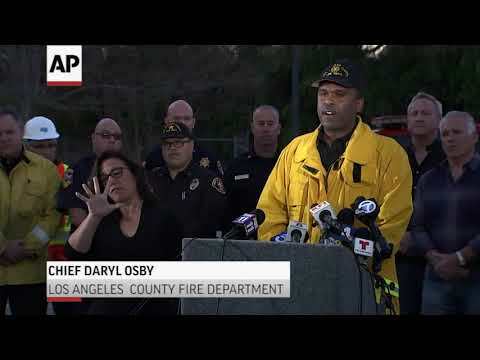 MALIBU, Calif. (AP) — Two people were found dead as a pair of wildfires stretched from inland canyons to the Pacific in Southern California on Saturday, leaving people sifting through the remains of both mansions and modest homes for anything they had left. The two bodies were found severely burned inside a car on a long residential driveway in Malibu, Los Angeles County sheriff’s Chief John Benedict said. The home is on a winding stretch of Mulholland Highway with steep panoramic views, where on Saturday the roadway was littered with rocks, a few large boulders and fallen power lines, some of them still on fire. Most of the surrounding structures were leveled. The deaths brings to 25 the number of people killed in the state’s wildfires in the past few days, with 23 found dead in a Northern California wildfire. Those vicious conditions on Friday night gave way to calm Saturday, with winds reduced to breezes. No new growth was reported on the larger of the two fires, which stands at 109 square miles (282 square kilometers), and firefighters now have the blaze 5 percent contained. Progress also came against the smaller fire, prompting Ventura County officials to allow people in a handful of communities to return to their homes. Hundreds of thousands across the region remain under evacuation orders, and could stay that way for days as winds pick up again. Osby said losses to homes were significant but did not say how many had burned. Officials said earlier that 150 houses had been destroyed and the number would rise. The fire hopscotched around the Oak Park neighborhood of 70-year-old Bill Bengston, leaving most houses untouched. The home for 22 years of Bengston and his wife, Ramona, was the only house on his block that burned. And it burned everything. The hardest to lose were the photos and the mementos handed down through the family — a cigar box that belonged to his great-grandfather; the handcuffs his father carried in World War II.